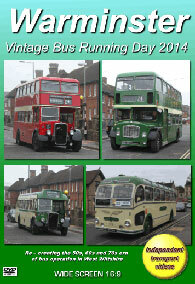 The popular Warminster Bus Running Day has again returned for 2014. This year the event took place on Sunday 12th October and the independent transport videos cameras were invited back to record the action for you to enjoy. This superb event sets out to re-create the 50s, 60s and 70s era of bus operation in West Wiltshire and this year certainly did not disappoint. The area has been traditionally the home of the Bristol/ECW marque of which a large number of the type are seen on our programme. These included Bristol L and K types, as well as LS, SU, MW and over seven REs as well as a Bristol FS, FLFs and a number of VRTs. We also see a myriad of other types of buses and coaches. There is an RTW and a green AEC Merlin from London Transport, a Daimler Fleetline from Southdown, a Leyland Tiger from King Alfred – to name but a few. You will have to watch the programme to see more! Our early morning filming starts at the ‘Coach Station’ in Warminster. Just as the fog is lifting we see the vehicles arriving to take up their duties for the day. Our cameras take up positions along Station Road, Market Place and in the ‘Coach Station’ to record the action. Later we take a ride on the superbly turned out former Bristol Omnibus Bristol RELL6L / ECW B50F 1257 (DAE 511K) on service 248 to Mere. On arrival at the Salisbury Street car park in Mere we meet up with Southern National Bristol LS coach 1376 (OTT 85) and Royal Blue liveried Bristol RELH coach 1472 (RDV 423H) on connecting services. We then travel back to Warminster on board 1257 to record more of the action in and around the ‘Coach Station’. Look out for two former Southern Vectis Bristol RELLs together for the first time in many years running on service 42 to Warminster Barracks. TDL 563K has a dual-purpose body and is painted in the deregulated Southern Vectis livery of dark green and sand, whilst TDL 564K was converted to open top by Southern Vectis and was known as the ‘Shanklin Pony’. The bus has now moved from the ‘Island’ and is now known as the ‘Mendip Mule’. On our return to Warminster further filming takes place along Station Road and Market Place. The final sequences of the day are filmed in the ‘Coach Station’ as the final arrivals and departures take place. We would like to thank Bob Eade and “H&DW&D” for organising this excellent event. Duration : 64 minutes (approx).